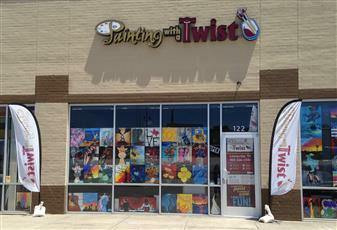 Here at Painting with a Twist we love to host private parties! Bachelorette parties, birthday parties, bridal showers, corporate events, holiday celebrations, kids’ parties, and more! To book your party, just email us at studio172@paintingwithatwist.com, call us at 469-316-1940, or fill out the party request form below. The minimum painters for ALL Private Parties to 10. That is ANY day of the week and ANY time of the day! Take advantage of this special now! The minimum painters for a VIP Party is 6. Choose your time, date, and Painting (based on availability). VIP Events are open to the public. For OFFSITE event request, please put the address of the Event and as many details you can so we can reply appropriately. We are Happy to come to you! Minimums do apply. $5.00 off per seat with a minimum of 30 paid seats or above..
Can only be utilized on $35.00 paintings or above. This discount is good at PWAT Lewisville only, and CAN NOT be combined with any other discounts, and is subject to change or be cancelled at Studio discretion. Book Your Event on the same day of your inquiry and receive a free $35 COMP to be used at a later date (Comp is not valid on private parties). Our studio rooms can accommodate 34 in our Small Room and up to 50 in our Large Studio room! VIP Parties must have a minimum of 6. (For VIP Parties, Parties must be booked at least two weeks in advance. You can also request your favorite artist and we will do our best to make sure that they can work your event!